The Powell Student Center was built in 1971, and serves as the heart of campus life. Current rennovations will better serve a new generation of Colonels. The renovation will incorporate the mid-century modern heritage of this building with contemporary interiors and updated mechanical and electrical systems, making it more comfortable and better adapted to current needs. 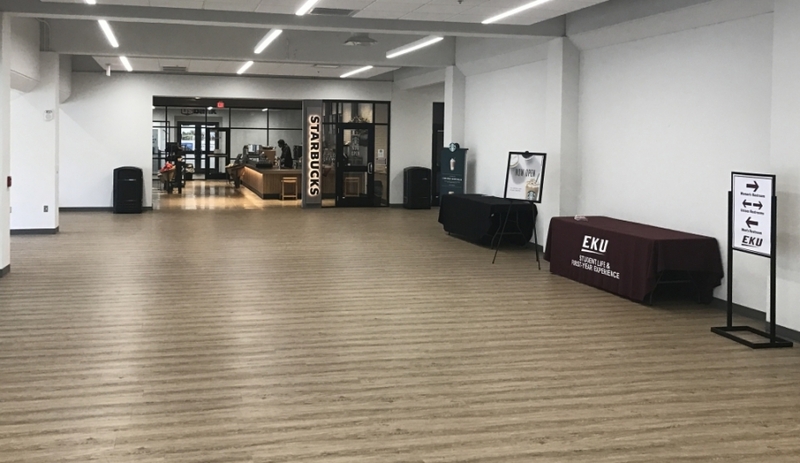 New spaces in the recently-opened firstphase of Powell include a Starbucks, Steak ‘n Shake and U. S. Bank, and a visit to this area on the plaza level gives a preview of the new look of Powell. Brian Wilcox, Associate VP of Facilities Services, Capital Construction and Project Administration said, "With the Powell renovation, we are enhancing the student experience by investing in student organizations and student-life programs". (EKU Vision 2020, Strategic Initiative 2.3.4). When the remainder of Powell opens in 2020 it will include other new amenities such as a relocated Barnes and Noble, new spaces for Student Government, an updated game room that will feature video games developed at EKU, an expanded multicultural space and many more meeting spaces for a variety of campus activities.